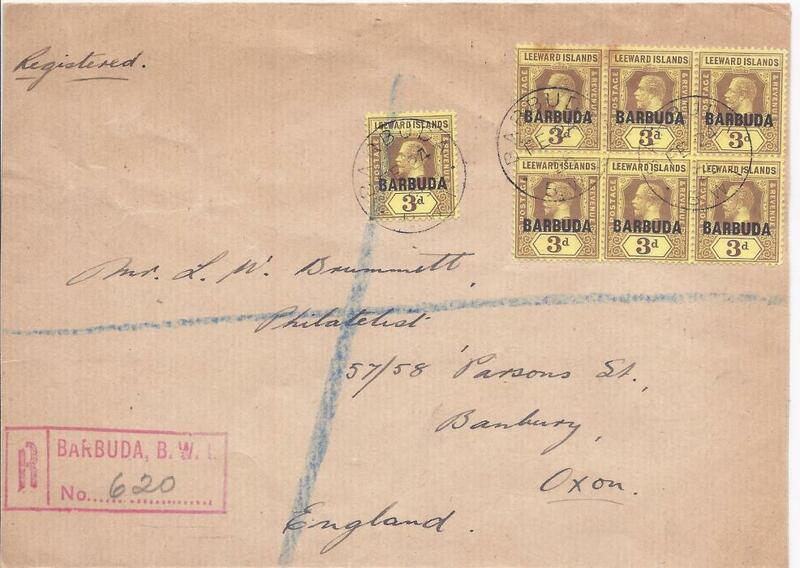 (Barbuda) 1925 registered cover to Banbury, England franked seven �BARBUDA� overprinted Leeward Island 3d. tied cds, red registration bottom left, reverse with St John�s Antigua transit and Registered Plymouth transits. 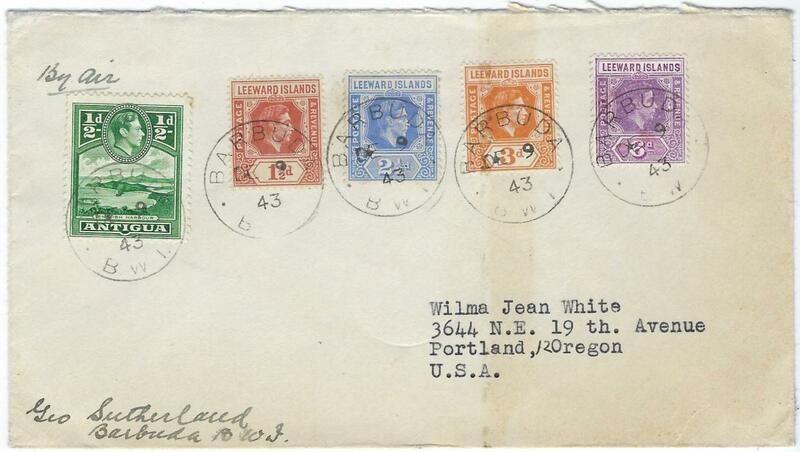 1926 (JY 6) registered cover to USA franked with unoverprinted Leeward Islands 1/2d. pair, 1d. and 6d. tied by two Barbuda B.W.I. 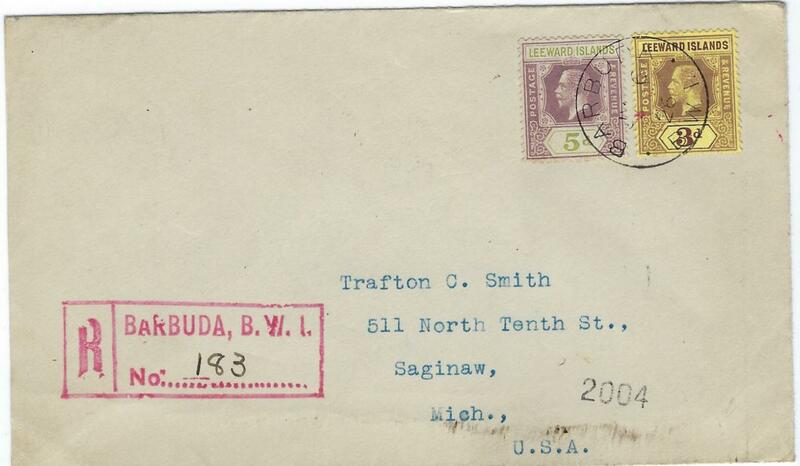 cds, fine red registration handstamp at left, reverse with St John�s and New York transits and Saginaw, Mich. arrival cds; fine condition. 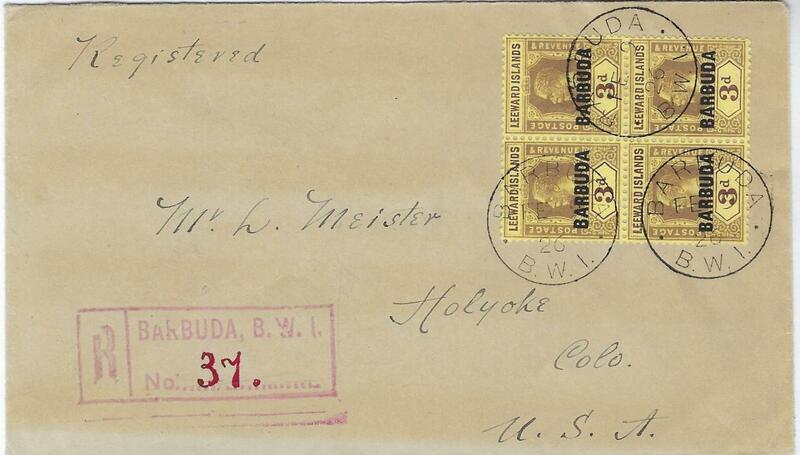 Barbuda 1923 (AP 10) registered cover to New York franked with overprinted Leeward Islands 1/2d. and 1d. 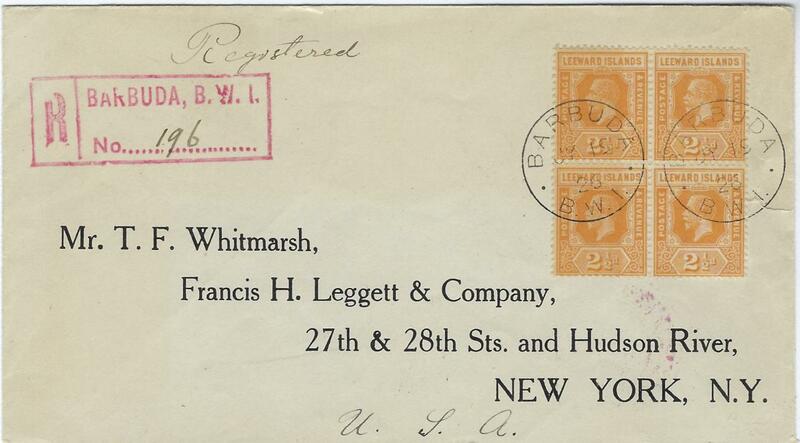 blocks of four, the 1d a corner plate �10� marginal, cancelled by two cds, red registration handstamp at left, reverse with St John�s transit and New York arrivals; a couple of slight faults to envelope, scarce control. 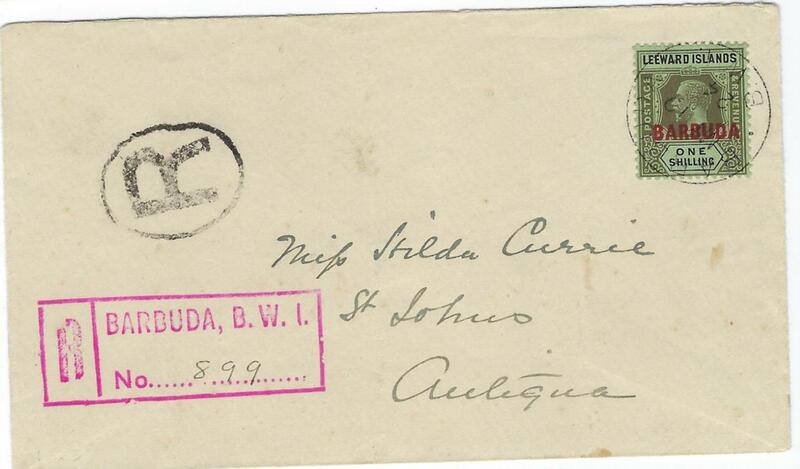 Barbuda 1924 (MY: 19) registered internal franked by overprinted Leeward Islands 1s. tied by cds, black and red registrations at left, some slight light creasing, no backstamps. Barbuda 1925 (JU 29) registered �Kinderlin� cover to Hall, Wurttemberg, Germany bearing single franking overprinted Leeward Islands 2s. tied by cds, red registration at left, reverse with St John�s transit and pictorial arrival cds. 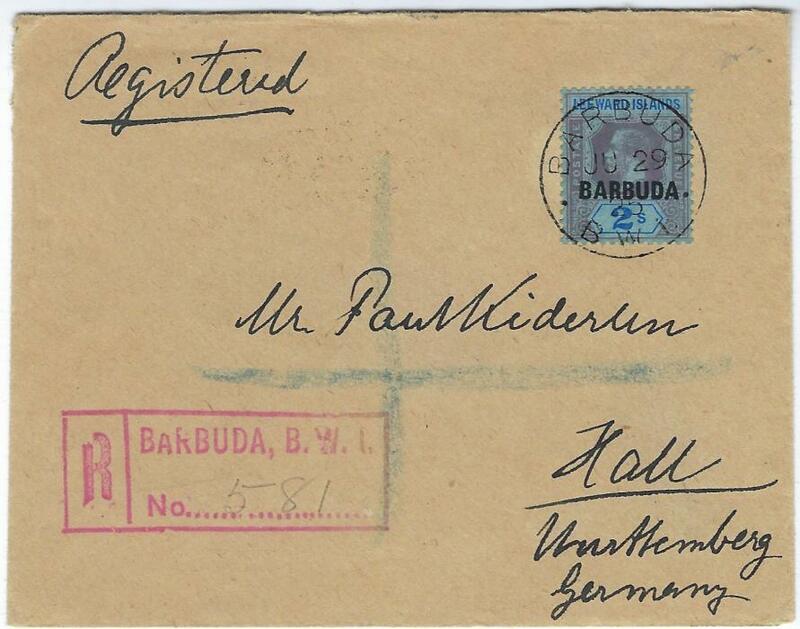 Barbuda 1925 (JU 29) registered �Kinderlin� cover to Hall, Wurttemberg, Germany bearing single franking overprinted Leeward Islands 3s. tied by cds, red registration at left, reverse with St John�s transit and pictorial arrival cds. 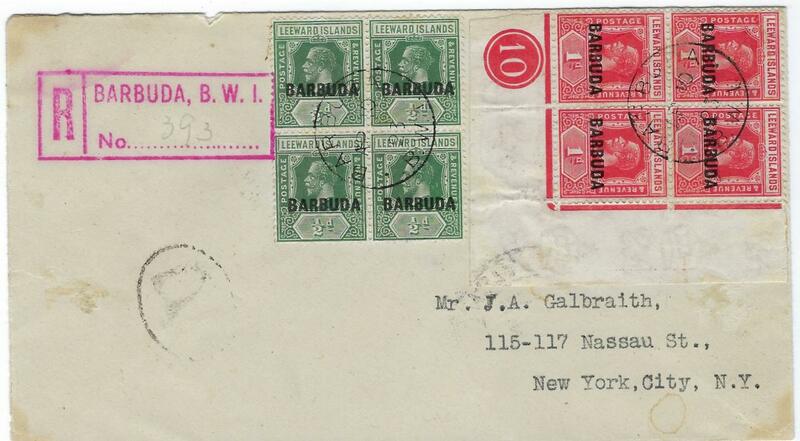 Barbuda 1926 (JY 19) registered cover to New York franked with unoverprinted Leeward Islands 2 1/2d. block of four tied by two cds, red registration handstamp at left, reverse with St John�s transit and New York arrival; fine condition with multiple of a scarce value. 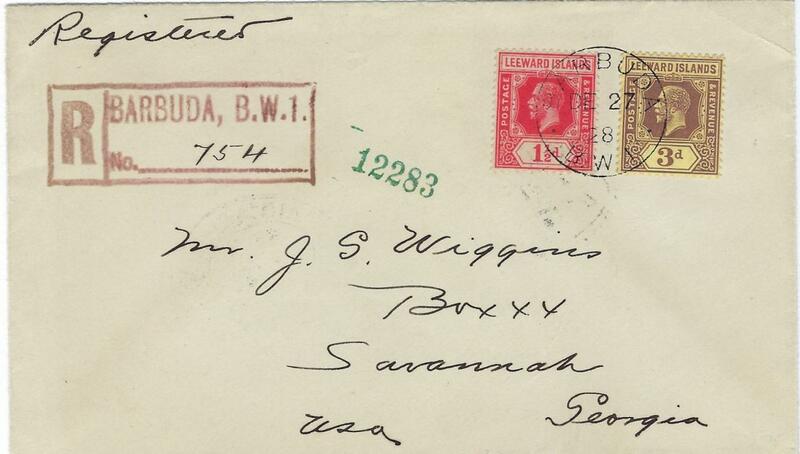 Barbuda 1926 (JY 6) registered cover to United States franked with unoverprinted Leeward Islands 5d. and 3d. tied by single cds, red registration handstamp at left, reverse with St John�s and New York transits and arrival cancels; small red mark on 3d. Barbuda 1943 (DE 9) cover to Portland, Oregon franked by five King George VI values (of Antigua and Leewards) each cancelled by cds, no backstamps. Barbuda 1944 (MY 30) registered cover to Portland, Oregon franked by five King George VI values including 5s each cancelled by cds, registration label at right and U.S. censorship tape at left, reverse with St John�s transit, Miami and New York transits and arrival cds. 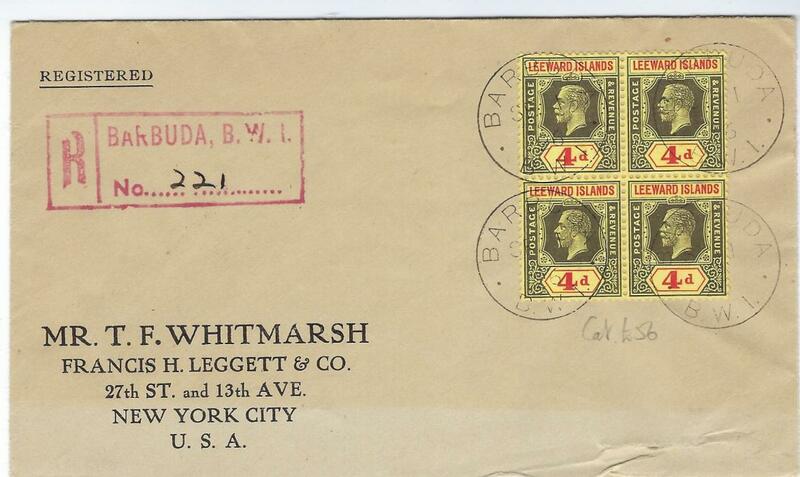 Barbuda: 1926 (SP 1) registered cover to New York franked with unoverprinted Leeward Islands 4d. 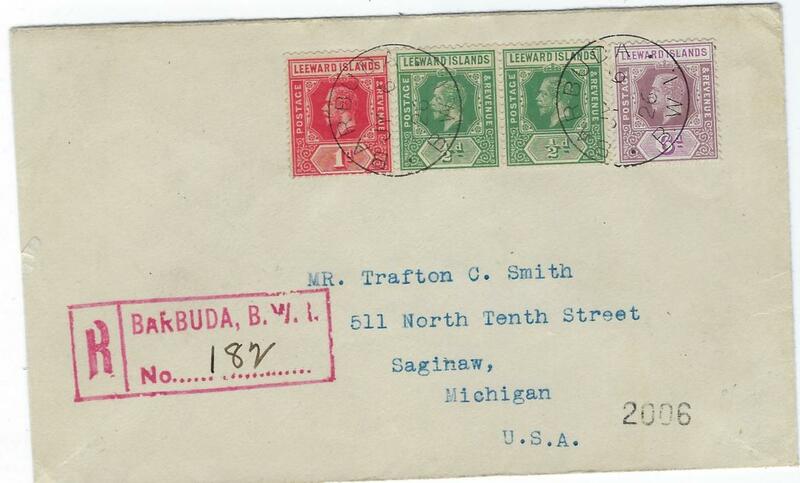 block of four tied by four cds, red registration handstamp at left, reverse with St John�s transit and arrival cancels; slight fault at base of envelope.